← How to compare PDF and a word document? In this article, I will show you how to convert Office file like, Word, Excel and PowerPoint, and target formats like PDF, WMF, EMF and specify the output image size. The software I use is VeryPDF Office to Any Converter, which is GUI version software, so the conversion could be done quite easily. Please check more information of this software on homepage. In the following part, I will show you how to use this software. Download Office to Any Converter. As this is GUI version software, you need to install it. When downloading finishes, there will be an exe file. Please install this software by double clicking the exe file and following installation message. When installation finishes, there will be an icon of this software which allows you to launch this software quickly. The following snapshot is from the software interface, please have a check. Step 2. Convert Office file to image and resize image. Open software interface and then drag all the Office file you need to convert to image to software interface. Once you add them to software interface, they will be listed on software interface with detail information like file size, file path and created date. When adding finishes, please click setting part, then you do set output image formats and resize image. The following snapshot is from the setting menu option. Please choose output image formats in Basic setting tab. 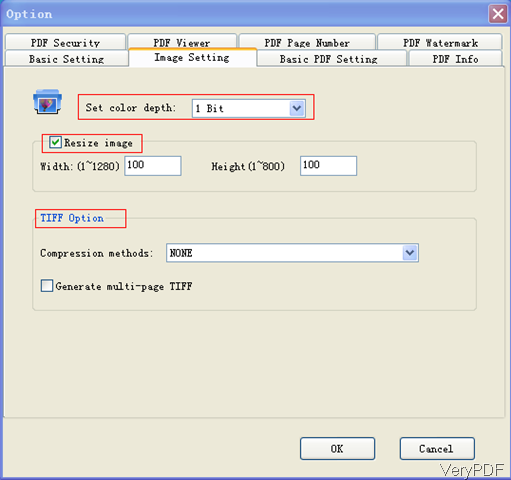 In the Image Setting part,here you can set image color depth as 1. 8 and 24-bit. In the Resize image part, you can specify image width and height. If the you set the output image formats as tiff here you can choose compression method. If you need to create multi-page tiff file, please choose that option. When output is image file format, other tabs will be useless for you. So you can click button OK to back to the main interface. In the interface, please click button Convert to Any and Save as. Then you will be reminded to choose the output folder then run the conversion at once. A few seconds later, you can check the output image file in specified output folder. Note:when converting Word Doc file to image, PDF, you do not need to have Office Word Application installed, which means this software can help you run the conversion from word to image without MS Office word installed. However, when converting other Office file, you need to install corresponding software application. When you need to convert Office file to image and resize image, this software will be a good helper for you. During the using, if you have any question, please contact us as soon as possible. This entry was posted in Office to Any Converter and tagged office to image. Bookmark the permalink.